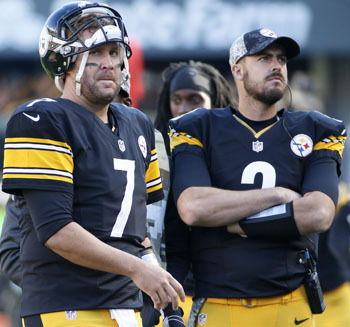 When Landry Jones left the game in the first quarter of the Pittsburgh Steelers’ Week 10 game at Heinz Field against the Cleveland Browns, fans held their breath as Ben Roethlisberger took the field. No one was sure what to expect of Roethlisberger, who had suffered a mid-foot sprain a week earlier against the Oakland Raiders. Once Roethlisberger proved to everyone he was fine, there was something more to this situation which could become an issue in the coming weeks for the black and gold. Jones left the field, was carted to the locker room and returned to the field a short time later with his ankle heavily wrapped. Heath Miller, the team’s emergency third string quarterback due to Mike Vick being inactive Sunday, spoke of feeling an ease come over him when he saw Jones return to the field. The ease everyone felt with No. 7 back in the lineup and Jones proving he is a capable backup might be short lived as Jones is set to have a MRI on his injured ankle. The date of the scan wasn’t made public, nor the results if it has already taken place, but if Jones is lost for any amount of time past the bye week, the Steelers could find themselves in quite the dilemma. If the scenario plays itself out where the Steelers will be without Jones for even a couple of weeks, it would be Mike Vick who would take over the backup duties behind Roethlisberger. Vick has done little to prove he is capable of moving the Steelers’ offense when given the nod, and has been a player who has struggled to stay healthy when playing for any extended period of time. This is merely speculation, but could become fact if Jones’ MRI results show up in a negative light. Will the Steelers entertain the thought of bringing in another quarterback to possibly compete with, or replace, Vick? That is doubtful at best. Vick has said he feels more comfortable in the Steelers’ system now, compared to a few weeks ago, and such a progression is natural. However, are the Steelers willing to go into a game, like their Week 12 matchup in the pacific northwest against the Seattle Seahawks, with a slightly injured Roethlisberger and Vick as the primary backup?